I am all about lips in my past entries. I simply can't help but rave about things that are worth sharing. I really don't mind seeing new or improved versions of makeup in any form because I love the fact that cosmetic companies keep revolutionizing their products and come up with much better ones along the way. Call it marketing strategy if you like but I still feel lucky that as a consumer I get to benefit from them and in return all I can offer is my patronage and recommendation. 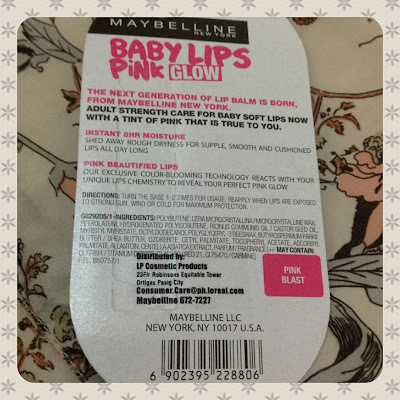 Maybelline has been one of my favorites in the cosmetics industry because they have quality products that are affordable. The latest addition to their baby lips, pink blast has become an instant hit. Though it's in a usual lip gloss packaging, I love the catchy pink and silver color. The first thing I noticed after removing the cap is the very pleasant fruity scent. It slides smoothly on your lips and feels light even after layering. 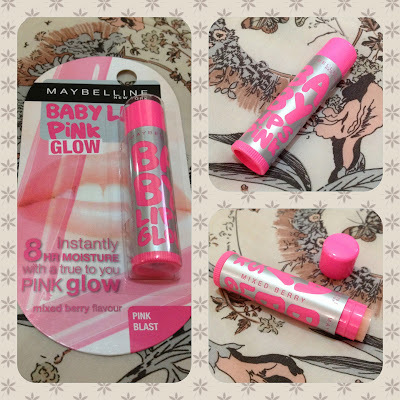 The opaque and colorless stick reminds me of petroleum jelly but gives naturally pink lips. It can be used alone or under any lip color. But I prefer using this every time I feel my lips drying. It keeps them moisturized for several hours hence reapplications are still needed for an extended effect. This product is truly a hit for me because it delivers results that don't go with a hefty tag. I recommend this to those who want an affordable lip balm that moisturizes and gives a hint of color.